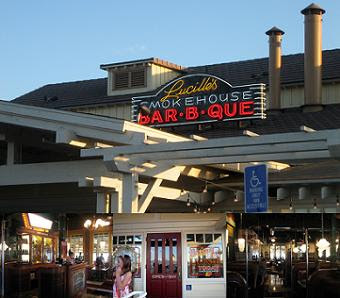 Kat's 9 Lives: Lucille's Bar-B-Que : Finally Got The Pictures! Their decor is very homely and reminiscent of an upscale backyard BBQ. They are usually busy so be sure to come early or you might have to wait a little for a seat. 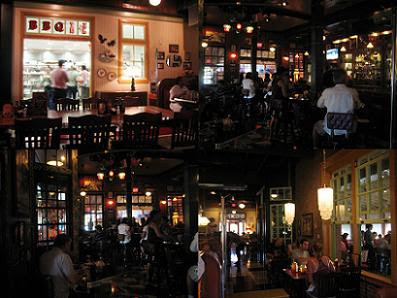 There is a bar to the immediate left as you enter and a pretty big dining area to the right. Lil Jalapeño ordered a Shrimp Po' Boy Sandwich. It's fried Shrimp served on a fresh Sourdough Baguette with shredded Lettuce, Vine-Riped Tomatoes, Smoked Jalapeño Tartar Sauce, and Spicy Remoulade. They actually gave a ton of shrimp. It was literally falling out of the sandwich! That's just the way I like it! ^_- Their sandwich looked good, but I don't think anyone can beat my favorite Shrimp Po' Boy at Harold & Belle's in LA. Tofu ordered the Lucille's BBQ Combo Platter, which is a choice of 2 BBQ items. He chose the Beef Ribs upon my recommendation and the Pulled Pork. I highly recommended the Roasted Garlic Mashed Potatoes to him. So he chose that and Shoestring Fries. He really enjoyed the mashed potatoes, as I knew he would. The beef ribs were huge. They are tender, big & meaty ribs, Spice-Rubbed, slowly Smoked, then glazed with their BBQ Sauce. The pulled pork is roasted, slow smoked, shredded, and tossed in their special sauce. It was very tender, juicy, and flavorful. For my dinner, I had to get the Baby Back Ribs and Beef Ribs. From my last experience, I knew the beef ribs were great and that it's more worthwhile to get the 2 item combo versus the 3. The more options you get, the smaller the portions! =*( BOO! lol So this time I went with a smaller choice, but a better quantity! For my sides I had to get the Roasted Garlic Mashed Potatoes and I got the Baked Potato to take home for my Mom. They serve a lot of food so there is always going to be food leftover. The baby back ribs are the tenderest & meatiest little pork ribs that's slow-cooked with sweet hickory smoke, then grilled, and basted with their special BBQ sauce. Both ribs were meaty and delicious. Pour on some extra Original Lucille's BBQ Sauce and you will be set. All in all the service was friendly. We sat there for a very long time, almost until closing, and we were not bothered by anyone. It's a very laid back place. The food was good and plentiful. Only Oreo was able to finish his meal. We all had to get boxes for home. It's still a little bit on the pricey side for me, but it's worth it if you are in the mood for BBQ. They DO serve cornbread. I get it on most of my visits there, and it's great. Try it, next time.